In the previous post we discussed how S3 can be incorporated as a storage mechanism in our overall Big Data infrastructure. We laid out the strategy for naming and storing raw data files and folders. In this post we’ll implement this strategy in the Amazon Kinesis client demo app which we worked on in this series on Amazon Kinesis. Have that Kinesis client demo app open in Visual Studio and let’s get to work! Log onto S3 and create a top bucket where all raw data files will be saved. 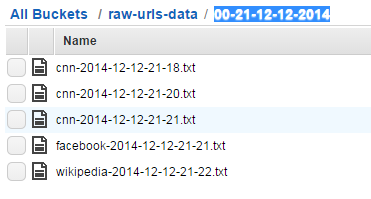 Let’s call the bucket “raw-urls-data”. We’ll add a couple of new methods to WebTransaction.cs of AmazonKinesisConsumer that will be used during the S3 persistence process. 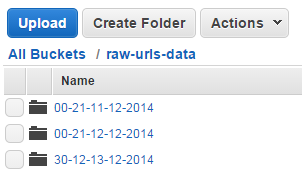 The above modification adds the human readable UTC date to the stringified view of the raw data point. We’re done with the preparations. It will be easier to follow what all these methods do later when we test the whole chain. We group the observations and then save the raw data for each group. You can find both data points in the screenshot above. Don’t assume that you can anticipate the order of the messages coming in from Kinesis. They are sent in batches and it is possible that two data points that should be saved in the same raw data file in S3 will come in two different batches. The result will be that the code will throw an exception when the second message is saved as there’s already a file with the required name. 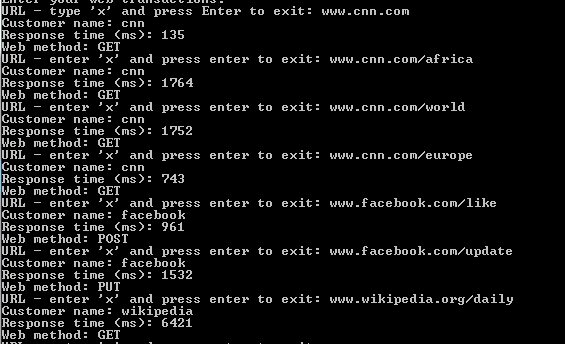 You could check for the existence of the file and extend its contents but that really slows down the performance. There’s no built-in update mechanism in S3 – you have to download the contents of the file, append the new content to it, delete the original file and upload a new one. Instead we can go with an extended naming convention for the raw data files and add a unique identifier to each batch from Kinesis, like a GUID or something similar. We’ll then go with the file name format of customer-year-month-day-hour-minute-batchnumber.txt. This post concludes our discussion of Amazon S3 in .NET. The next series will look at another storage mechanism offered by Amazon: DynamoDb which is Amazon’s take on the NoSql world. We’ll discuss this database solution and see how it can fit into a cloud based Big Data architecture.